Out of the most divisive issues comes unity. Last week saw an unprecedented Planning Committee meeting, it lasted three days and on the third day the meeting it went late into the evening. At stake was either safe shelter for 350 or the future of Vanier and its financial growth. The heart of the matter revolved around the Salvation Army relocating to Montreal Rd in Vanier from their George Street location in the Byward Market. In what has become a war of words over the future of Vanier, the Battle of Vanier is clearly between two ideals; land use versus building use. City staff is on the land use side while Rideau Vanier Mathieu Fleury is arguing the building use will have severe impacts on Vanier. In the middle of summer the Salvation Army filed a proposal to build a new large 350 bed facility that would locate all its services in one location (the current Concord Hotel) on Montreal Rd, which is classified a “mainstreet” by the city’s official plan. Ottawa now prohibits shelters on its mainstreets. Mainstreets by definition are meant for commerce and community gathering and keeping people moving. For the Salvation Army, the official plan will need to be amended. It gets confusing and bewildering because City staff support a proposal that clearly goes against the Official City Plan, which City Staff had a huge hand in writing. With its support, planning staff is saying that the needed amendment ‘won’t be a problem at all’. If you have trouble understanding how the mainstreet argument works consider other Mainstreet and “Main” street locations across Ottawa as examples. How about a large shelter on Strandherd Drive in Barrhaven, or on Meadowlands Drive in Keith Egli’s ward. Try selling a huge 300-bed shelter to Stittsville residents on Hazeldean Drive and I doubt anyone would allow a shelter beside a shiny condo on Richmond Road or even putting a shelter at the corner of Bank and Somerset downtown instead of rebuilding Somerset House. There was another aspect in the Battle of Vanier, one which could have been avoided – The Mayor. The ink on the proposal was barely dry when Mayor Jim Watson came out in support of the Salvation Army’s plans. He voiced his support before the proposal was looked at by staff, was debated at Planning Committee, before residents could have a say and before the full Council vote. The Mayor holds great sway in council. He’ll try to tell he is one of 24 votes, honestly though, his “yeah or nay” will sway about a quarter of council seats. Coming out early on this forced Councillor Fleury to publically fight against the Mayor and most of council. Whether the Mayor intentionally or accidently played his cards, he should have stayed quiet. I expect that he will lose votes in the fall, as SOS Vanier will make sure Rideau Vanier voters don’t forget who supported them and that the Mayor did not. By stating his support early in the process, the Mayor muted Councillor Fleury and virtually snubbed the 100+ residents and businesses that went to committee and stated their reasons for objecting to the proposal. Clearly the Salvation Army did not expect such uproar. They almost admitted it, but could not find the right words when the Salvation Army spokesperson appeared on CBC Radio Ottawa Morning after the Council vote of 23-7 (Rick Chiarelli claimed a conflict). They admitted they had a lot of fence mending to do, but could not commit to saying they did not know the community well enough to foresee the outrage against the plans. It was clear from the moment that SOS Vanier was formed by Vanier business owner Drew Dobson that who ever came up short in the vote at council would be appealing to the Ontario Municipal Board. Depending on the OMB outcome there could a lawsuit, which all means that it could be years before the wrecking ball comes down on the Concord Motel, which sits on the proposed Salvation Army building. Speaking of the Concord Motel, there is a complication. The City of Ottawa is very tight for space for families that need emergency shelter, for days weeks or months. Guess where some families are put up, paid for by the City of Ottawa? The Concord Motel. Where will the City find the rooms lost with the demo of the Concord for the families that need the space? Good Question. The City better home the new Federal National Housing Plan works, and fast! There is some good that comes out of the Battle of Vanier. The community has come together, again. The last time that happened was with the proposed closure of the Montfort Hospital. The Ontario government stood down from that because the community banded together. The Salvation Army shelter plan was the spark that brought Vanier back to its feet; I hope they don’t underestimate the community as Mike Harris did. SOS Vanier is here for a while and plan on keeping this issue alive. Secondly, Councillor Fleury stood on his head defended his residents; I have not seen a councillor do that in some time. It was an “All-Star Performance” in the defense of Vanier and preserving Montreal Road. At worst he has almost secured a re-election with his efforts to protect his community with something he saw as being a bad fit. The leaders of SOS Vanier have publically declared they will appeal the decision at the OMB, the Battle was won – the war wages on. This entry was posted in Affordable Houisng, Ottawa, Ottawa Elections, Politics and tagged Homelessness, Mathieu Fleury, Mayor Jim Watson, Rideau-Vanier, Salvation Army, Shelters, SOS Vanier on November 26, 2017 by redheartbluesign. The Ontario government is conducting a Basic Income Pilot project in three locations; Thunder Bay, Lindsay and Hamilton. The pilot provides a basic income of $17,000 to approx. 34,000 people that currently receive money from the Ontario Works (OW) and Ontario Disability Support Programs (ODSP). The $17,000 is a huge increase to those now receiving $13,000 or less from the government, but it is a paltry amount for most Ontarians. You have to consider for whom a basic income is directed at and you’ll understand the need for more for this segment of Ontario’s population. Using the example of a single male on ODSP and it’s shocking what some people in Ontario are forced to live on. After rent is automatically deducted from the ODSP, it leaves less than $500 for hydro, phone/internet, food, transit fees and other items for the rest of the month. Could you pay hydro, and other bills with only $500 a month and eat well? It was not always like this, our social assistance system was friendlier and more generous. Multiple governments have reduced programs and allowances available and not increased payments to meet increased costs for expenses. At one point ODSP included a number of allowances including moving allowances but with those gone the cost of a move eats further into the leftovers and leaves no chance to for people to improve their living conditions. There are approximately 900,000 Ontarians receiving assistance through ODSP and other Social Assistance Programs representing just 6.5% of Ontario’s population. In the recent Ontario budget the Wynne Government allocated money to allow increase limits for those on ODSP etc. to earn more with less being clawed back. The governments’ focus on support payments is on families and children that because of a job loss saw these families fall well below the poverty line and reliant on the government. For many this doesn’t provide any comfort, they don’t have the assets to claim against assistance and have little opportunity to make more money, so they fall further behind month by month. For many they will rely on food banks and the generosity of friends providing $20, $40 or more when needed. Many don’t ask because they don’t want to be a burden, so they suffer invisibly. It’s sad to see people we know go moneyless up to half way through a month, because what’s left after rent doesn’t see them through to the first week of the month. What makes me angry is while the Ontario government seems to be focused on families/children on ODSP and OW their attention does not reach the singles who struggle just as much each month. Long-time progressives in the Wynne government like former Ottawa Vanier MPP Madeline Meillieur and current Ottawa Centre MPP Yasir Naqvi seem to have blinders when assisting those without dependents. Baby steps by the government may help families, the singles, as they get older, fall further and further behind and will become a larger burden on the government because they have no pension; savings support avenues available to them. General consensus with budgeting states that 30% to 35% of a person’s annual income should go to housing costs, and that includes hydro. Even if we up the 35% to 50% a single person on ODSP with annual rent of $9000, the annual income that should be received is $18,000. In reality, rent accounts for 68% of ODSP for the single person and if you add average hydro of $70/month that increases to a whopping 75% of annual income going to housing and hydro. Someone please tell me how anyone lives on 25% of an annual income? At this point, I hope that the Ontario PC’s or Ontario NDP understand the plight of the few in Ontario (I’ve given up hope Wynne and Ontario Liberals will ever understand this). A solution is to change how ODSP is fixed to recipients. Rather than have a fixed amount of money received each month, the amount paid should be a fixed percentage of how much housing costs should be. If the government were to fix housing costs to 40% of the annual income, the ODSP recipient would see an increase of their payments to $17,100. The result? While rent increases happen annually, so too will ODSP to meet the most important monthly cost that is taken out of the month government cheque. Without this, the motivation to move to a better location is destroyed as increased rent results in decreased spending for all other living expenses. I realize that this gets very close to the government sponsored basic monthly income pilot – what separates it from that program though is the ability to change housing due to any number of reasons; accessibility, declining living conditions, and safety. Rent increases will not affect what might be left after rent is paid. The basic income does not do this. I propose to look after the number one need of those of assistance, housing, and the remainder will be less stressful on the first of each month, or as a friend calls it “King for a Day”. This entry was posted in Affordable Houisng, Ontario, Ontario Politics and tagged Affordable Housing, Basic Income, Decent Housing, ODSP, Poverty, Rent Increases on September 6, 2017 by redheartbluesign. December 2011 I posted “the Collective Benefits of Ending Homelessness”, since then, over 5 years, there have been 500+ clicks to see the post. Five plus years later, it is time for an update. In those five years the conversation has shifted, it has moved from talking about ending homelessness to having available affordable housing, in essence the conversation could now be the “Collective Benefits of Affordable Housing”. Back in 2011 I wrote about the then Federal Conservative Government plans to reduce homelessness by finding and funding places for people to get off the streets and under a roof. Was it the right approach? Where does the search to end homelessness begin? Is this is a chicken or the egg situation? What is the right beginning, to create new housing to move people to a house from a room or fund shelter spaces to move people off the street? Whatever the solution, it helps the circle of movement move faster and more efficiently (one hopes). Since the 2012 report from the Ottawa Alliance to End Homelessness (ATEH) there has been an increase in the number of people accessing homeless spaces. The 2016 report (http://endhomelessnessottawa.ca/resources/2016-progress-report-on-ending-homelessness/) shows that 7170 individuals used a shelter of some sort, not since 2012 have over 7000 people sought a shelter for the night. There is some indication that the federal plan of 2011 has had a positive impact as numbers dropped to 6508 in 2014, but that number has been slowly creeping back up to the numbers released recently by the ATEH. Why isn’t the needle moving in a positive direction on this? What is hold us back? With a 10 year commitment from the City of Ottawa to reduce homelessness in its 4th year, there remains a concern that the needs are not being met – and that the reasons for it are changing. Affordability is becoming more and more the reason for not having a permanent home. Youth are couch surfing and families are moving into smaller homes as the cost of rent and everyday needs (like hydro) increase without solid solutions to reduce or stabilize the cost of staying in a home. In 2012 it was estimated that 1000 new housing units were needed annually in Ottawa to meet, reduce and eliminate homelessness. In five years the City of Ottawa has created just under 1300. Based what the ATEH estimated, the Ottawa is 3700 units behind its needs. It is clear to me each new government has its own ideas for solutions to ending homeless and in 2017 we see affordability becoming a huge issue as the cost to purchase a home rises annually. The Liberals in Ottawa announced $11B over 11 years as part of National housing strategy, but that money is being spread over several initiatives – the $11B sounds like an incredible figure and it is. But on an annual basis the figures do not seem as impressive. As an example, the $3.2B in the Renewed Federal-Provincial-territorial Partnership for seniors housing over 11 years is less than $300M each year. The $11B is a good first step nationally, but for the 10,000+ on the Ottawa housing wait list it will take years to build those roofs and walls and eventually end homelessness in Ottawa and other communities across Canada. What needs to be addressed is how governments can help the unknown those families, youth and individuals who are not on wait list, we don’t know where they are today or where they will be tonight. I have hopes that by distributing the $11B through the CMHC it will be a much more effective and efficient flow of funding rather than previously when the money flowed through three different government hands before it got to the providers and builders of affordable housing. One positive out of the 2017 budget is that it should reduce the reporting structure for how the money used while this funding is available over 11 years. 2017 and 2018 will see several Municipal and Provincial elections held, for the social and affordable housing sectors these will be important to hold governments to account for a lack of progress and to ensure incoming governments and councils will take actions that will see less use of shelters as more rooms, apartments and houses for youth, seniors and families will be ready with doors wide open for them. This entry was posted in Affordable Houisng, Ontario, Ottawa and tagged Affordable Housing, Homelessness, The Alliance to end Homelessness on April 18, 2017 by redheartbluesign. 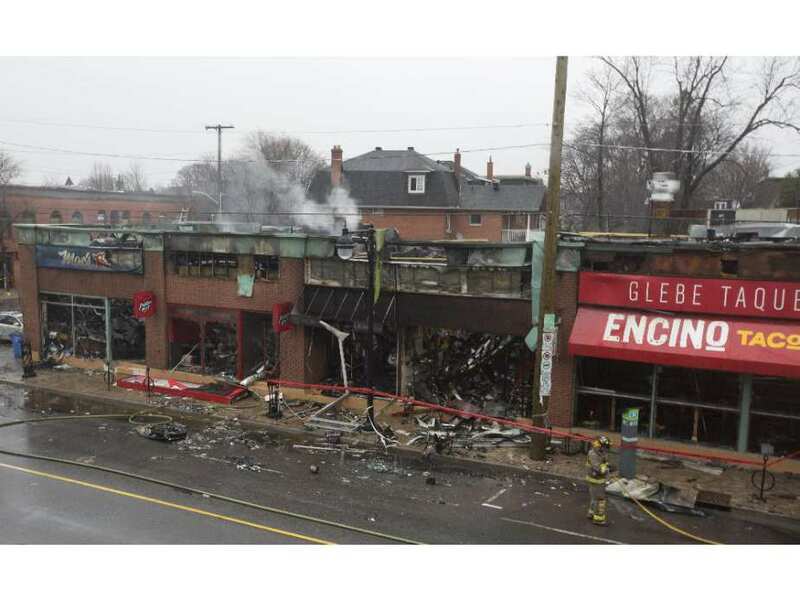 This week’s fire in the Glebe was tragic, seven businesses lost their home and 50 people have lost employment. There will be a rebuild, the owners of the building say it will rise again, as it was – a one-story building. But should it stay the same? Isn’t there a case for more? Not a multi floor condo building but how about there now being a case for affordable rental units, somewhere to provide a home for singles, mothers with children and families? When first built in the 70’s, our housing landscape was much different than it is now. Ottawa was a sleepy National Capital where the streets did roll up at 6pm. Today and 40 years later Ottawa is vibrant and now there is much activity late into the evening. As the city grew it attracted many people as a place to live. As populations grow, so do the pressures of housing, homelessness and poverty. Today there are 10,000 people on a waiting list for affordable housing. The Glebe in the last few decades has also seen a transformation, especially with TD Place and Lansdowne Park now in place. 40 years later there is a higher demand for affordable housing that needs to be met. Local initiatives like “Broadening the Base” are good partnerships for the owners of the burned out building. The City of Ottawa also has programs that assist the private sector in creating affordable spaces. It becomes even more enticing for the City to be involved in since recent announcement that 10’s of Millions of dollars are coming to Ottawa from Queens Park to create spaces and help eliminate homelessness. Build into the equation that there are several top notch not for profit organizations that would be excellent partners for George Halel and Sam Bellama to fill these units. While George and Sam have balked at the suggestion of apartments, they also call the Glebe a good community. It’s a good community that needs new low rent units that can help others that need a good community. I think that the idea of adding more to the a good community is something that Messer’s Bellama and Halel need to seriously consider. Working with Capital Ward Councillor David Chernushenko may result with a quick approval of plans through the planning process and construction so that the businesses can be back home, but also so others might have a new one. This entry was posted in Affordable Houisng, Ottawa and tagged Broadening the Base, Glebe Fire. Affordable Housing, GlebeFire, Ottawa on April 12, 2015 by redheartbluesign.